Sheltering in the interstices between Sea and Mountains, Sun and Wind, Light and Shade, are deep memories of what we were, and of where we belong. Those who instinctively seek quality will find layers of experience here that escape many visitors. The present-day guardians of the island, inheritors of the ancient Greek and Minoan cultures, provide a link with our own past. Whilst there may be little new to learn from these people, there is, far more importantly, a massive catalogue of human experience to remember! This is a place for seeking personal truths, for growing and developing, for creative introspection and healing. ... and experience the warmth and friendship of these wonderful people and their legendary hospitality. All the year round, temperatures are near-perfect for human existence. In the mountains, the traveller can walk... and walk... in glorious silence. Next to the sea, find a secret place to undress... swim naked... and then dry lazily in the sun. But be careful - it's narcotic... you can be hooked for life. 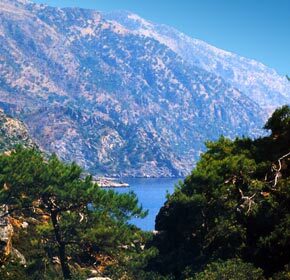 Mythologically, the island is the birthplace of Zeus who had three sons with Europe, the Queen of Phoenicia. 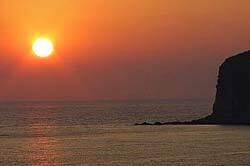 One of the sons, Minos, gave his name to Crete's most prosperous historical period, the Minoan Culture, some 5,000 years ago. This island is close to the origins of civilised humanity as we know it. 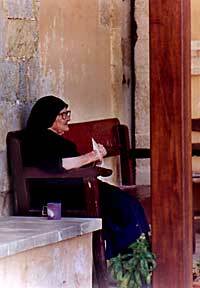 The history of Crete makes fascinating reading - this island is indeed the cradle of us all. 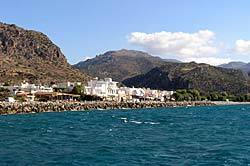 Crete is the fifth largest island in the Mediterranean, and the most Southerly point in Europe. Today, it is primarily an agricultural and commercial society, exporting nuts, grapes, olives, and wine - a real, living, working culture as opposed to some mirage created by the international leisure industry. The climate is mild in winter and warm and sunny through spring, summer and autumn, with a cooling breeze on even the hottest of days. 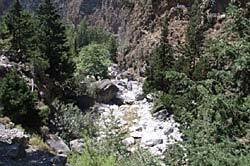 The island is surprisingly green; during the winter, rain and snow collect on the mountains to provide water for the whole year. 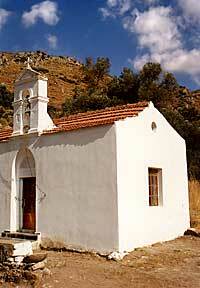 In images : Kissamos Kastelli and its surroundings. Kastelli is truly thousands of years old. Archaeological evidence, some older than Knossos, is everywhere. In Roman times the population was 35,000 � the equivalent of a major city of those times � now less than a tenth of that. Kastelli, simply meaning Castle in Greek, is the old name for the town which the authorities have renamed Kissamos � the same name as the county. All the local people still call it Kastelli. The town is still a self-contained lively bustling community with a traditional mixture of general stores, shops, bars restaurants and sea-front promenade cafes. The recently opened museum in the centre of the town is a must. The larger of the two fishing ports is home to the boats that visit the nearby Gramvousa islands. 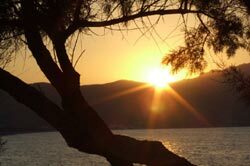 There is a twice-weekly, regular, full-size car ferry service to the island of Kithira, then Gytheio near Kalamata on the mainland and then on to the main Greek port of Piraeus/Athens. At the West Crete touring crossroads, Tavronitis is a busy working village almost oblivious to visitors. 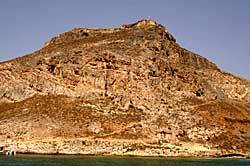 With spectacular mountain and beach scenery, (the aerial photo on our Welcome Page), and an old fort, Gramvousa was a base for marauding pirates for many centuries. The area is only recently accessible by special boat. 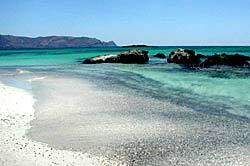 On the far West coast, Fallasarna is a place of legend and mystery, with one of the most beautiful beaches in all of Crete. Mile after mile of pink sandy beaches, with cedar trees and its very own desert island a few hundred metres offshore. A small town with a huge appetite for fun - 24 hours a day..! The main street closes to traffic at night, and seems to become one huge restaurant. 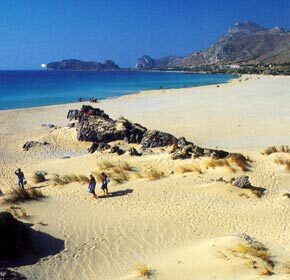 Paleochora also has a beautiful beach, at the foot of magnificent mountains. At 18 Km, the gorge is the longest, deepest ravine in Europe - in places narrowing to only 2.5 metres wide.